Senator Manny Pacquiao may have just given a simple ice cream vendor the surprise of his life. In one go, the boxer-turned-politician gave the vendor money, a house and lot, plus a job. A certain Jen Manilay from General Santos City took to Facebook yesterday, May 27, to share the video of Pacquiao with the ice cream vendor who is known as Manong Marciano. According to Manilay, Pacquiao was waiting inside his car when she called Manong Marciano so she can buy ice cream to battle the sweltering heat. Manilay recognised Manong Marciano as her suki (loyal customer) from whom she always buys ice cream whenever he passes by her office building. Manilay also appears to be one of the companions of the senator. Manilay said that Pacquiao first gave Manong Marciano P3,000 (S$76.60), but upon discovering he recently had a stroke and has three children who haven't enrolled yet for school, Pacquiao gave him another P30,000. Meanwhile, Manong Marciano looked shellshocked and teary-eyed upon realizing what was happening. Manilay added that Manong Marciano now has money to buy his medicine, as well as a new job waiting for him. "Hindi narin mahihirapan magtinda ng ice cream in a very sunny afternoon dahil binigyan narin namin si manong ng trabaho sa Goldenstate (He would also no longer have difficulty selling ice cream in a very sunny afternoon because we also already gave him a job in Goldenstate)," continued Manilay, possibly pertaining to the Goldenstate College in General Santos, South Cotabato. It was not mentioned, however, what job Manong Marciano was given. "See you again next week Manong Marciano… at sa bago mong bahay at lupa (and [with] your new house and lot)," she added. 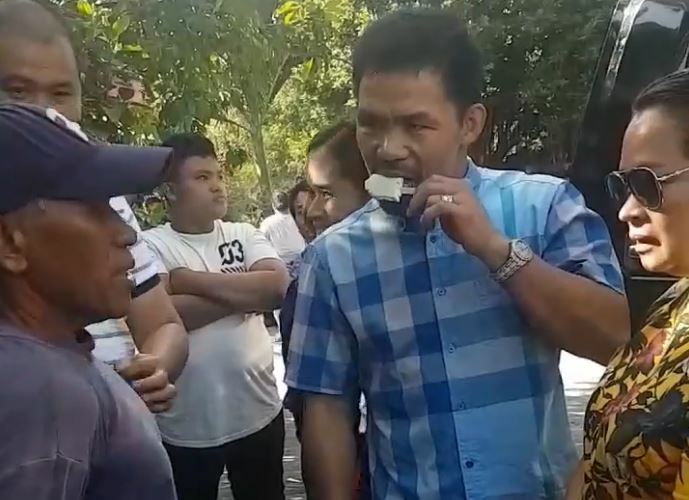 In Manilay's video below, Pacquiao can be seen eating ice cream with his companions while they spoke to Manong Marciano on the street.